Africa... the world's second largest continent. It conjures visions of tawny lions, stately giraffes, lumbering elephants and a host of other strange and wondrous creatures. On this safari, we travel to the southern part of the continent, to parks legendary for their diversity of wildlife and scenic wonders - meandering floodplains, open woodlands, and vast inland marshes. This landscape supports an array of fascinating plants ranging from towering cactus-like candelabra trees to the bizarre, massive baobab tree. Such diverse habitats draw dense concentrations of wildlife for which Africa is so famous, offering unparalleled opportunities for viewing and photography. We will find, photograph and observe animals as we take game drives in specially modified four-wheel drive vehicles, boat outings in marsh areas, and bush walks with professional guides. The result will be unbelievable sightings and lifelong memories of our planet's most spectacular animals. Our adventure begins in Maun, Botswana's gateway to the Okavango Delta and Moremi Wildlife Reserve. This region is a mecca for those who wish to experience the African wild. Part of a vast basin, each year the Okavango Delta seasonally fills with water, drawing large numbers of animals to its numerous islands. From our lodge in the heart of the Delta, we'll be perfectly situated to do explorations on foot and in traditional dugout mokoro canoes. Experienced African guides will pole us through winding channels and reed beds, an absolutely primeval environment. We'll take bush walks and follow game trails for views of antelope, zebra, giraffe, buffalo, and elephants. We'll return to our chalets for dinner and cocktails and a spectacular view over the Delta. Next we'll visit Botswana's Chobe National Park. Game drives in open jeeps and boat explorations will bring close, awe-inspiring views of great African mammals - hippos, lions, buffalo, and antelope, including the puku, a Chobe specialty. This is the heart of elephant country and we will watch the huge herds beside the Chobe River. 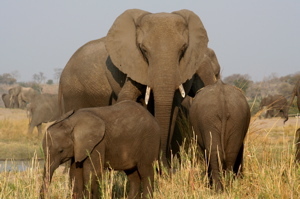 Chobe has the largest elephant population in all of Africa - estimated at over 50,000. The river attracts stunning birds like spoonbills, carmine bee-eaters, saddle-billed storks, malachite kingfishers, and fish eagles. 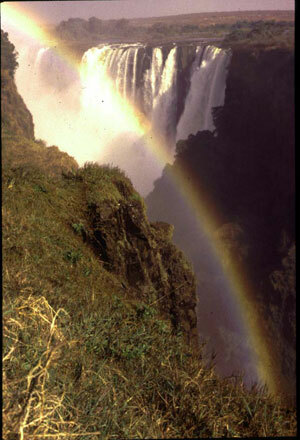 We continue our journey at Victoria Falls, where we'll walk the trail that leads to the "Smoke that Thunders." A mile wide and nearly twice the height of Niagara, Victoria Falls is the stuff of legend. We will walk through spray-drenched forest to the gorge edge. We'll also visit one of Africa's largest craft markets, with fine carvings, traditional baskets, and colorful cloth. This is a safari in the true African tradition. In the Okavango, we'll stay in individually designed reed chalets with en-suite bathrooms, each nestled among trees on the banks of the Boro River. For the camping portion, guests are accomodated in fully serviced comfort in domed tents with camp beds, clean linen, bedside tables and battery lamps, toilets (two for eight guests), and hot showers. Our last night will be at the beautiful Ilala Lodge, within earshot of the distant thunder of the Victoria Falls. This trip is a small group experience: we can accomodate 8 people, plus your guide, on one safari vehicle. We may have the option to add a second safari vehicle, if there is demand. A lifelong naturalist with an irresistible curiosity, Peter Debes, your Nature Discoveries guide, has excited hundreds of travelers about the fascinating wonders of nature. Peter brings years of study, interest and love for all living things to this expedition. Peter has led seven previous safaris to southern Africa, as well many other expeditions to remote corners of our planet, including Madagascar, Peru, and the Galapagos. For the entire trip, we'll have the added expertise and assistance of professional guides, drivers, and boatmen, who know the ways and whereabouts of the local wildlife. 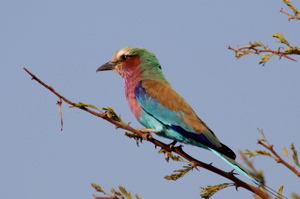 Nature Discoveries is pleased to again offer this incredible safari to Botswana and Victoria Falls. We guarantee you'll have treasured memories that will last a lifetime. "Thank you for a great, unforgettable trip!" "Highlights? The animals, the birds, especially the jousting giraffes, the wild dogs, the bee-eaters...and the mokoros gliding through the water lilies...and so much more!" "Landscape at Motobo Hills was totally unexpected." "Excellent leadership and planning...great itinerary." "Sunset over the Chobe River...night sounds in the Okavango." "Visiting the villages...seeing the home and family life [of local guides]."